Thank you so much to everyone who has been a part of my journey. There’s so much more to be done and I hope you’ll continue to support me along this road as we discover together what lies ahead. 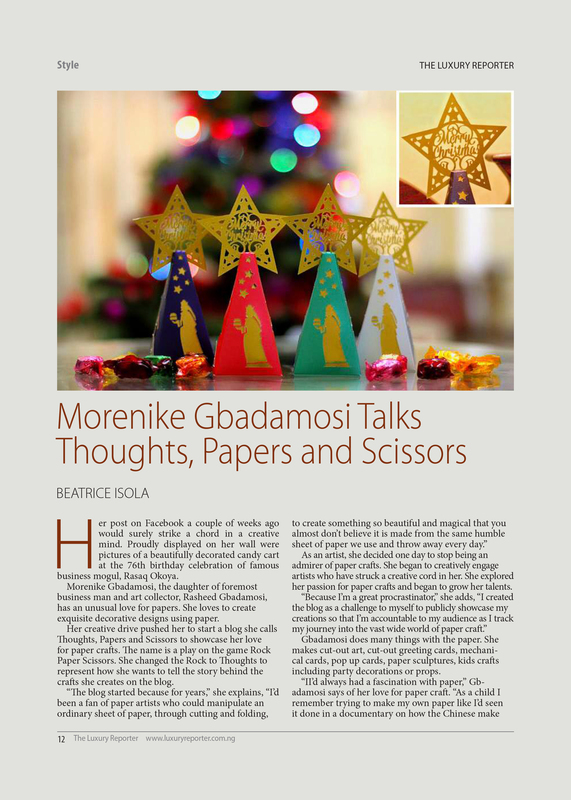 This entry was posted in Press and tagged article, Chief Rasaq Okoya, Chief Rasheed Gbadamosi, feature, Funke Osae-Brown, Lagos, magazine, Morenike Gbadamosi, Nigeria, paper craft, PaperArtist, papercraft, Press, The Luxury Reporter, thoughts paper scissors, TLR. Bookmark the permalink.